Sens. 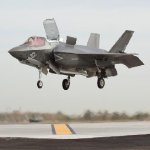 John Cornyn (R-Texas) and James Inhofe (R-Oklahoma) have called on President Donald Trump to support the sale of the Lockheed Martin-built F-35B fighter aircraft to Taiwan to help the East Asian state build up its air defense capabilities. The lawmakers wrote a letter to Trump Monday and asked his administration to supply additional F-16V fighter jets “if determined that release of the F-35B to Taiwan is premature,” the U.S.-Taiwan Business Council said in a news release Monday. “These fighters will have a positive impact on Taiwan’s self-defense and would act as a necessary deterrent to China’s aggressive military posture across the Asia-Pacific region,” they added. Rupert Hammond-Chambers, president of the US-Taiwan Business Council, said the council believes the sale of additional fighter jets to Taiwan supports the White House’s policy to advance “capacity-building” among Asian allies, offers U.S. companies an opportunity to export defense systems and serves a response to China’s force modernization initiatives.